Power 29 / 26 kW 39 / 35 hp Width 1700 mm 70"
Speed 2400 rpm Height 2530 mm 100"
Torque YJ240 model Min. ground clearance 260 mm 10"
Fuel consumption <230 g/kw.h Max. dumping height 2650 mm 104"
*Optional: Xinchai 490/498, Perkins and Cummins engine Dumping reach 1050 mm 41"
Wheel base 2100 mm 83"
Loading weight 1000 kg 2205 lbs Min. 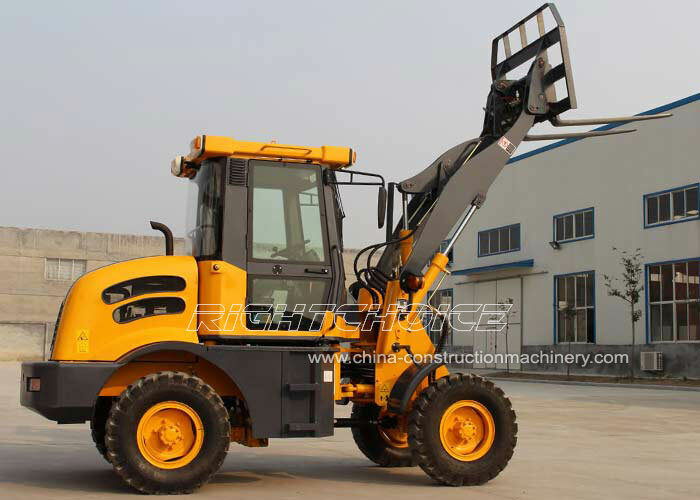 Turning radius 3600 mm 142"
Construction Machinery Manufacturers - The RC10 wheel loader incorporates the latest technological advancements in both engineering and comfort. 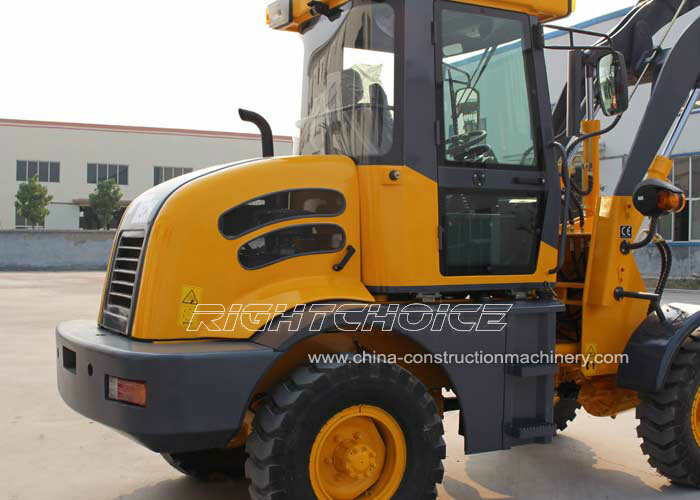 The improvements made to the RC10 wheel loader are thanks to the recommendations made by our most valuable source, our customers. As a result the RC10 model is an outstandingly easy-to-use and reliable machine able to perform optimally in almost all conditions. 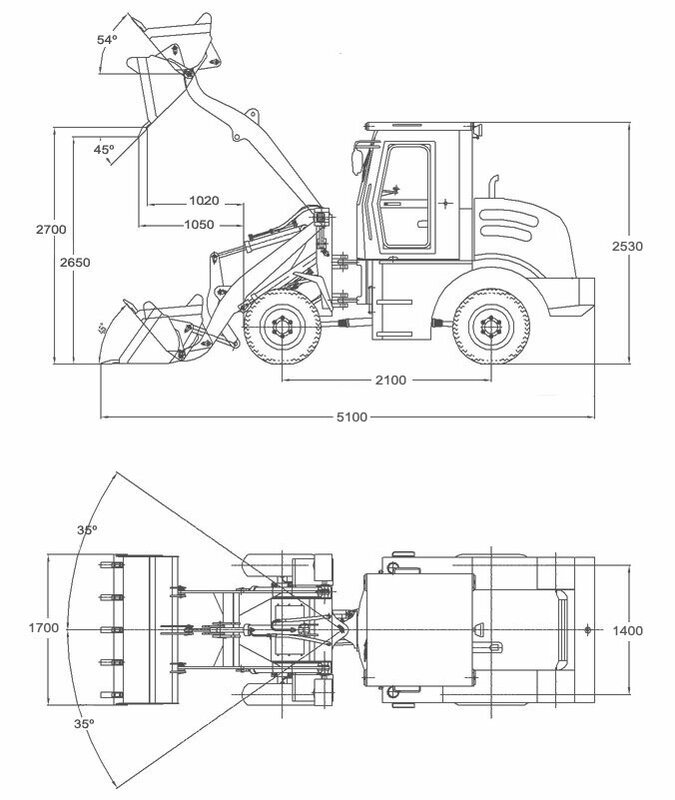 The RC10 has an operating weight of 3480 kg, a loading weight capacity of 1000 kg (1 ton) and a standard bucket size of 0.6 m³. Larger buckets are also available on request. 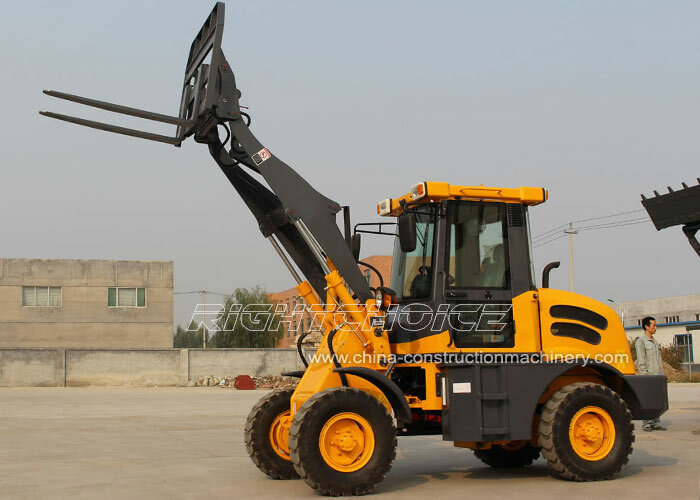 The attachments we manufacture for this wheel loader makes this machine an affordable and indispensable piece of equipment for any farm, constructions site and small to medium size civil worksite. 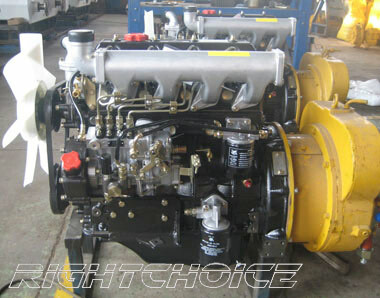 A leading brand in the Chinese market Changchai engines are known for their high performance and durability. The 490 model has been optimally design to ensure high efficiency, minimum vibration and easy maintenance. 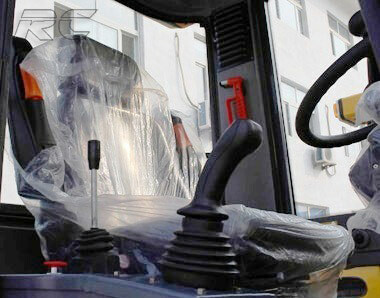 Changchai 490 is a 4 cylinder (90 mm bore), water cooling, four stroke diesel engine. It has a rated power of 29 kW at 2400 r/min. Its torque is of 167 N.m at a rotating speed of 2400 r/min. 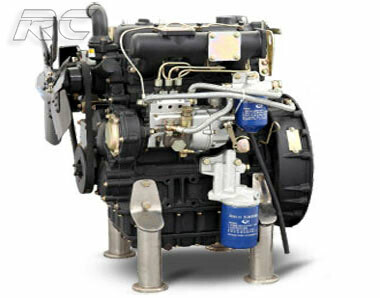 We also manufacture the RC10 with Xinchai 490/498 engines (right picture), Perkins engines and Cummins engines according to our customers' requirements. Compact and powerful the RC10 wheel loader has been optimally designed to maximize stability while ensuring maximum output efficiency. The RC10 has a full length (bucket on ground) of 5100 mm and full width of 1700mm with 35° steering angles and 12° hunting angles. 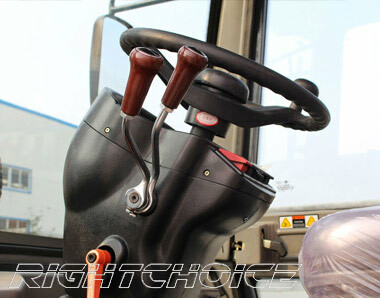 This allows the RC10 to excel both off-road and in closed spaces such as in warehouse facilities. With maximum leg-space and comfort in mind, the RC10 has been fit with a luxury cabin, E-mark seat, adjustable steering wheel, back rear camera and mechanical joystick. 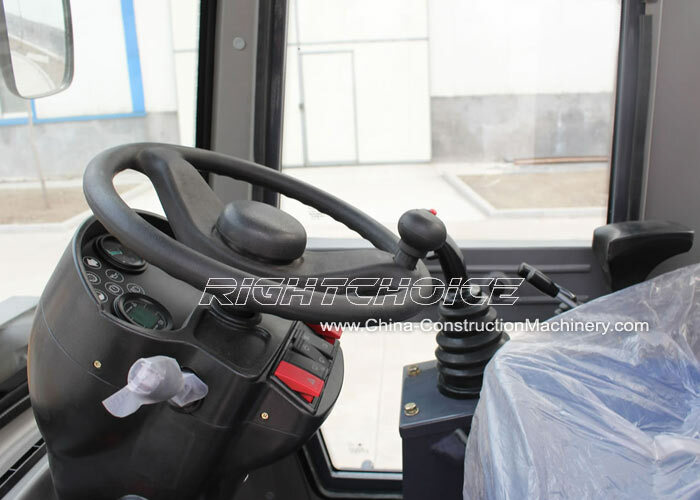 These features allow the operator to conduct all tasks in a totally relaxed environment, ultimately increasing productivity. The RC10 drive system is composed of a YJ1 240 torque converter, a fixed-spindle power shift gear box with 2 advance and 2 reverse positions and 35-40 kW transmission power. The drive pump is a CBN-E316 model (16 ml/r) and the main retarder is an arc cone gear first reduction type with a 6:37 drive ratio. 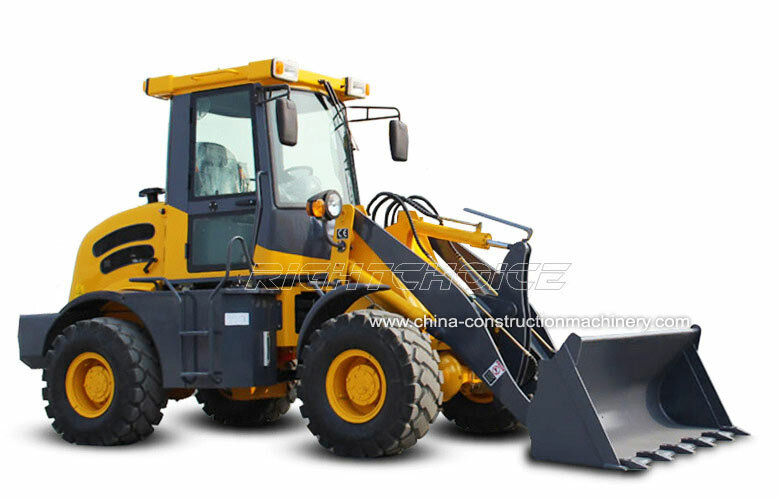 We make numerous attachments for the RC10 wheel loader model. This includes 4-in-1 buckets, snow buckets, V snow blades, flat buckets, grass forks, sweepers, barrel grapples, etc. 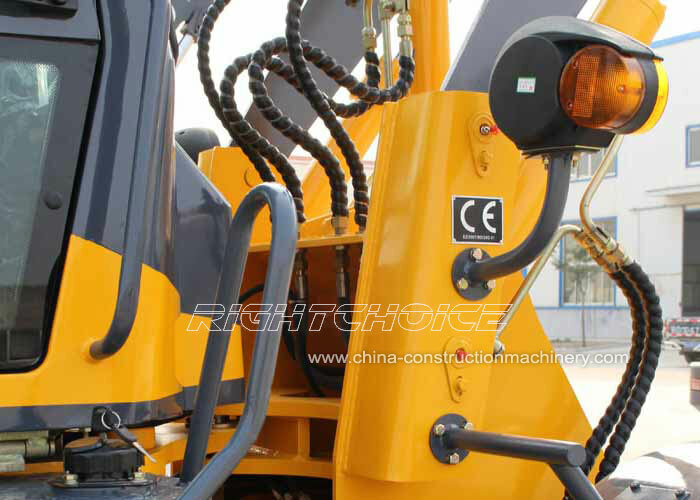 We are one of the most reliable and flexible construction machinery manufacturers in China and are able to quickly make any modifications to the machines. 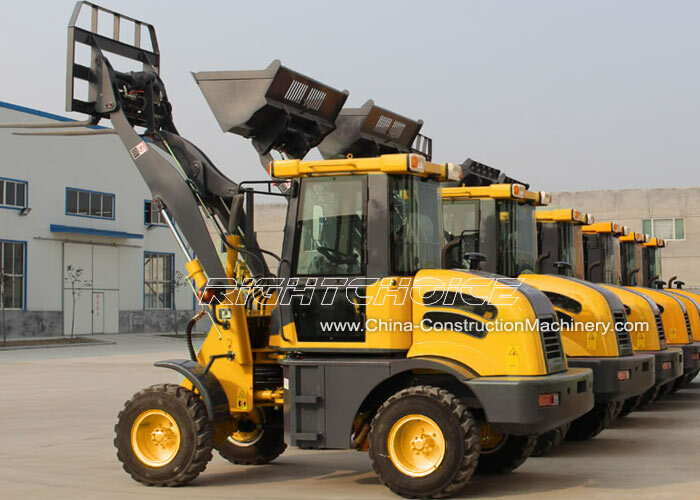 You can inquire about any of our wheel loaders by contacting one of our RIGHT CHOICE construction machinery manufacturers friendly sales members.